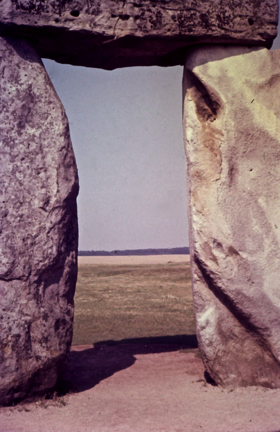 Stonehenge, rising out of the plain of Salisbury, in southwest England (Wiltshire). These monolithic pillars, some still capped with their horizontal lintels, are the subject of continued research. Basic consensus is that they began in the neolithic period. In southern England the neolithic (literally, the “new stone” age) dates from the first farming communities in roughly 4,000 B.C.E. to the development of bronze about 2,000 B.C.E. Most megaliths, if not all, were constructed in this period. 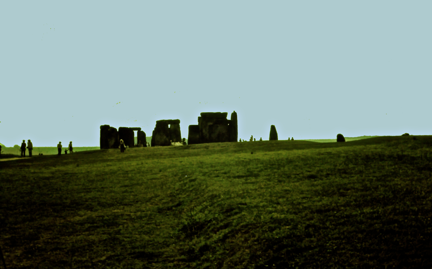 A conservative estimate is that there are over 1,000 stone circles (or “circular” variations – eggs, arcs, horseshoes, etc.,) in the British Isles, with an additional 10,000 round barrows (sepulchre mounds), while one writer states there are more than 40,000 megalithic sites, explaining the number exceeds the number of all modern towns and villages. Period I, with radio carbon dating to 3,100 B.C.E., consisted of a 320 foot diameter circle (98 m.), consisting of a ditch with an internal bank. There were 56 holes around its perimeter, and a wooden sanctuary in the center. The circle was aligned with the summer solstice, the winter solstice, and various lunar settings. Period II, about 2,600 to 2,150 B.C.E. 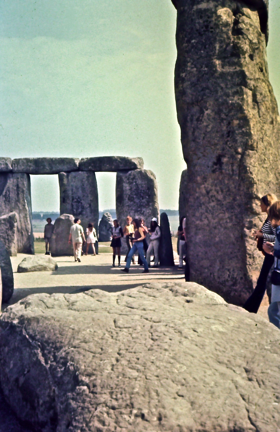 depending on the source, featured the replacement of the wooden sanctuary with two circles of “bluestones” (dolerite stone with a bluish tint), construction of an entrance way, and outside the larger circle, the thirty-five ton “Heel Stone.” Purpose of the “heel” stone was to align the rising sun with the elements in the circle – an “aiming” point used to set up a line of sight. The bluestones were brought – just how remains a mystery – 240 miles (386 km.) from the Prescelly Mountains in Wales. Their weight averaged 5 tons (10,000 lbs or 4,500 kilos). 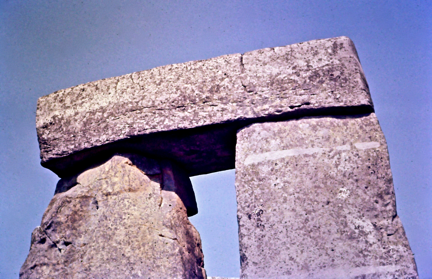 Period III, 2,400 to 2,075 B.C.E., again depending upon the source, marked the time the bluestones were taken down, to be replaced by the massive Sarsen stones we see today. These are essentially sandstones, which have been bound by a silica cement, and are prevalent on Salisbury Plain. The stones average eighteen feet in height (5.5 m.), and their average weight is twenty-five tons (50,000 pounds or 22,700 kilos). Period IV took place between 1,100 and 1,500 B.C.E., and involved resetting about sixty of the bluestones in a ring inside the Sarsen circle. 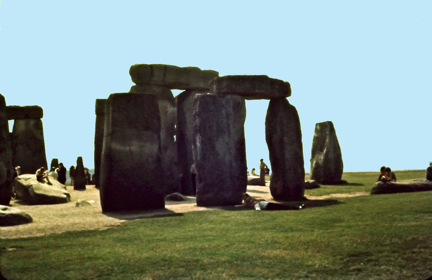 An additional nineteen bluestones were placed in a horseshoe configuration, also inside the Sarsen circle. Activity appears to have ceased in the immediate area about 1,100 B.C.E. Some believed the Druids were the builders, notably the antiquarian John Aubrey in the 17th century, basically England's first archaeologist. Others have speculated about Phoenicians, Greeks, or even Atlanteans. The Druids did not arrive in the area until just a few hundred years prior to the Christian era, so that theory is without credence. The others are pure speculation not based on fact. The identity of the builders is unknown. The consensus, however, seems clear that this place was an astronomical observatory, meant to determine the solstices of winter and summer, and it can be assumed the equinoxes of spring and fall. It has to be understood that early man, once having cultivated plants and domesticated animals, relied heavily on those for basic survival. Planting seeds in northern climates prematurely could have caused the death of the community, since people probably ate a portion of their harvest - seeds, whatever - and planted the rest, with little or no room for error. For instance, if you ate all of the seeds you harvested, you'd have nothing to plant. If you were hungry and sustained yourself by eating all or most of your seeds, you would still be cutting off your future because the following Spring there would be little or nothing to plant. If a warm spell hit an area in February, for example, reminding people of planting time, a return to winter in March might have meant the total ruination of the seedlings, which might have already sprouted. Knowing when Spring had actually arrived became a critical part of survival. Societies all over the world have created markings, which indicated the vernal equinox. Stonehenge was one such place. 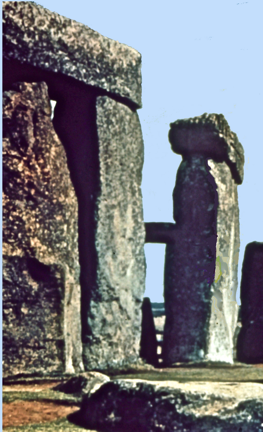 Now while there were some other post and lintel constructions of similar nature scattered through northern Europe, Stonehenge remains relatively unique, especially since it was not a structure which provided a shelter for any particular function - other than astronomical. So it was not emulated in profusion. Also, and quite importantly, there are markings (chalk-filled holes) to determine lunar eclipses. This latter would have made the group of shamans, priests, leaders - whoever had access to the configurations - all the more powerful because of their ability to forecast something as spectacular as an eclipse. Computers have been able to determine that an eighteen-year cycle of lunar eclipses was predictable from knowledge of the placement of the markings, and it can be assumed these holes were, therefore, an early form of calculator or computer. So, if you can, imagine a shaman hanging around the plains of Salisbury telling the people in his congregation "somebody is going to take a bite out of the moon tonight." And sure enough that night somebody or something does take a bite out of the moon. Well, that priest was the only one who knew what the circles and holes were all about, so he was held in serious esteem. Whether it was for ego, riches, power, control, or all of the above, that priest was special. Consider also that life spans were not very long - perhaps thirty-five or forty years, and so eighteen-year lunar eclipse cycles would not be in everyone's memory, and certainly not a repetition of those events - all adding to the mystique of the priest's prediction. A perfect example of post and lintel architecture: there are concentric circles of construction here, with those additional concentric outer rings of holes of eclipse markers. The main circle is 30.5 meters in diameter (100'). Stones seem to have been brought over a distance of 30 kilometers (48 miles). Some of the uprights weigh 50 tons (100,000 pounds, 45,360 kilos). Inside the circle of stones: the accomplishment is remarkable, as is so often the case with the construction of gigantic monoliths of stone. Exactly how the stone was quarried, transported, and erected might always be a mystery. 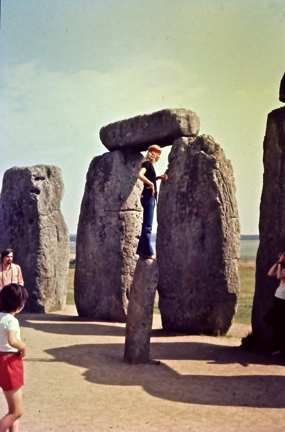 Unfortunately, too many tourists wearing down the place, and literally climbing all over Stonehenge, have led to the closing of the inside of the rings.